Make the crust: In a medium bowl, whisk together the flour, sugar, and salt. Sprinkle the butter into the bowl and work it into the flour mixture using your fingers. Stop when the mixture looks like cornmeal studded with small chunks of butter. Sprinkle 6 tbsp ice water on top and stir with a fork until the dough begins to come together. If needed, add another tbsp or two of water. Pour the dough out onto a lightly floured surface and knead three times. Gather into a ball, then divide into two pieces, one slightly larger than the other, and press them into disks. Wrap in plastic wrap and refrigerate for 30 minutes. Meanwhile, prepare the filling: In a large bowl, toss the apples with the sugars, lemon juice, cornstarch, and spice. Preheat the oven to 425°F and set a rack to the lowest position. Unwrap the bigger disk of dough and lay it on a lightly floured surface. Working from the center, roll the dough out to a 13-inch circle, lifting and turning it often to keep it from sticking to the counter. Transfer it to a 9-inch pie plate and press it into the sides, draping any excess over the edge. Fill the crust with the apple mixture, making the pile a bit higher in the center. Transfer to the refrigerator to chill while you roll out the top crust. Unwrap the smaller disk of dough and roll it out to a 10-inch circle as above. 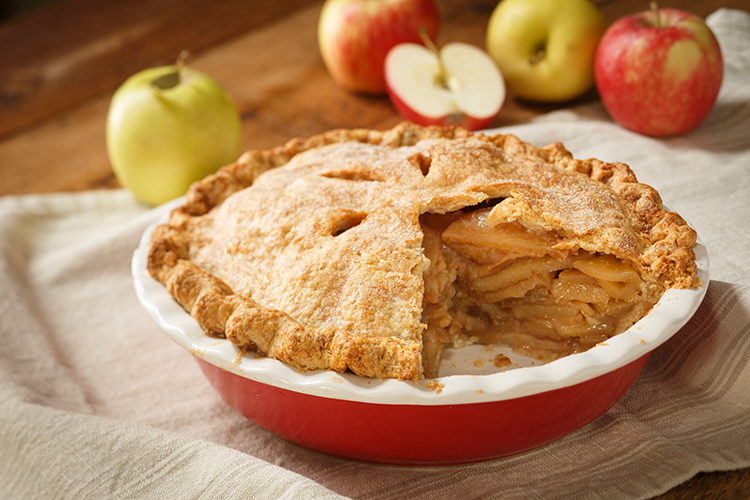 Lay it over the apple filling and use a sharp knife to make two 3-inch slashes in the top crust. Fold the bottom crust up over the top and crimp to seal. Pinch the crust between your thumb and forefinger at regular intervals to crimp. Brush the crust all over with milk. Put the pie on a baking sheet and bake on the lowest rack for 10 minutes. Reduce the heat to 350°F and bake until juices are bubbling and the crust is golden brown, 40 to 50 more minutes. Cool on a rack for at least 45 minutes before serving.